HomeAll articlesSafe use also in the vertical position! Thanks to integrated muting inputs, applications can now be monitored in which material is simultaneously transported in and out. The material is detected by the safety laser scanner and it can cross the protected field without deceleration of the conveyor. This will avoid downtimes and increase productivity. With the PSENscan Light, Master and Slave versions you can monitor up to 70 switchable configurations and up to three separate zones simultaneously. Up to four safety laser scanners can be connected in series, thus reducing the cabling and set-up work considerably. The warning fields and protected fields are freely configurable. 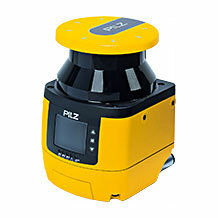 With its compact housing, PSENscan can be integrated flexibly into various applications.